In our last blog post we told the Sunbank story; why and how we started down this road. In this post we hope to answer a pressing question for anyone looking into solar – why are photovoltaic panels, herein referred to as PV, so popular and solar water heating (or solar thermal) so much less well known? The story is a complicated one – one of technological wins and losses, of partisan politics, and industry cohesion. Before I go into the history, let’s first differentiate between solar PV and solar thermal. And before I can differentiate between solar thermal and PV I should first differentiate between the various types of solar thermal. Unlike the PV industry, in which most of the technology is more or less the same, thermal is much more diverse of an industry. Bear with me for a second because this is going to get a little wonky. There are two main variables that differentiate solar thermal systems. Active vs. passive and direct vs indirect. An active system utilizes a pump to transfer heat between a collector and tank whereas a passive system uses natural convection. A direct system has potable water go through the collector whereas an indirect system has a water/glycol mixture (lower freezing temperature) go through the collector. These things are important, because solar thermal systems must be protected from freezing and overheating – and there are various methods for achieving this. The Sunbank doesn’t fit into any of these categories. Instead, it borrows the best attributes from each. It most closely resembles the top right box, except instead of having potable water in the collectors it only has it in the tank. This makes it more freeze tolerant without the need for pumps that consume electricity and eventually break over time. There are other valid types of solar water heaters, especially for very cold climates or warm climates with intermittent use, but after a lot of research we decided on the Sunbank type system because it is more affordable, simpler to install, and has less maintenance issues than the other types of systems. So, from here on out when we say solar water heater we are referring to the Sunbank. Now, let’s compare solar thermal and solar PV. PV creates electricity, is 15% efficient, and typically costs $20,000 – $30,000 for a residential installation. Solar water heating, on the other hand, offsets the use of gas or electricity by heating water. It can be up to 90% efficient and the typical residential system costs less than $5,000. Looking at this table you can see that the Sunbank is less expensive and more efficient, so why isn’t it more common than PV? First, let’s go back in time. Solar thermal has been around for millennia in the sense that we’ve been using the sun to heat things since we first existed. 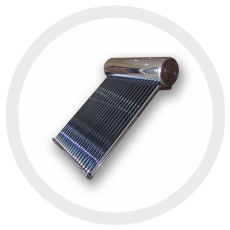 The first commercial solar water heater dates back to the 1896 when Clarence Kemp of Baltimore, Maryland created what he referred to as the “Climax” solar water heater. The design since improved in iterations to account for the two main issues with solar water heaters: freeze protection and overheat protection. 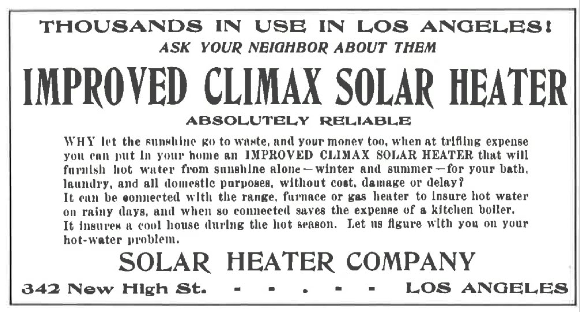 By the 1920s solar water heaters were ubiquitous throughout Florida and Southern California. Interest spiked in the 1960s and again after the 1973 Oil Embargo. 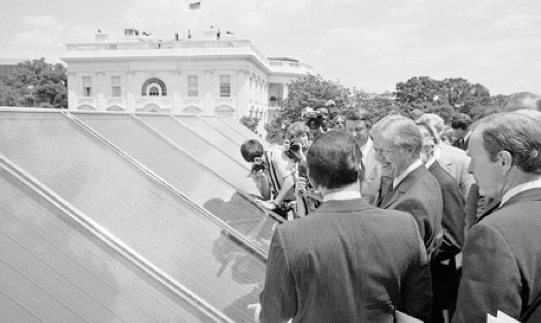 Jimmy Carter put solar PV and solar water heaters on the White House and the industry looked on its way to being a strong contributor to the country’s energy portfolio. Meanwhile, solar water heating was taking off in other parts of the world. In Israel, for example, solar water heaters became popular as there was a fuel shortage in the new country in the 1950s. 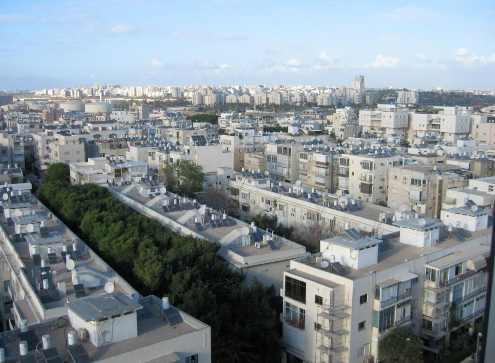 In the 1970s the energy crisis brought with it a law passed by the Israeli congress, the Knesset, that all new homes (except high rises without adequate roof space) must have solar water heaters. Now there are solar water heaters on 85% of Israeli homes which saves the country an estimated 2 million barrels of oil per year. What do these historic vignettes illustrate? First, that the success of solar water heating is directly tied to the price of energy. Cheap fossil fuels inhibit innovation and adoption, whereas fuel shortages and high prices increase these rates. In these cases, the energy crisis spurred installations of solar water heaters. Secondly, government incentives and mandates (or lack thereof) are an effective motivating force for people to make a switch to alternative energy that they would otherwise ignore for an alternative energy technology to experience high rates of adoption, a government incentive or mandate is highly beneficial. Have questions about Solar Thermal and how you can join the movement? Tweet us @SunbankSolar or contact us today!